We're now well into the new year. My college schedule is starting to come together. 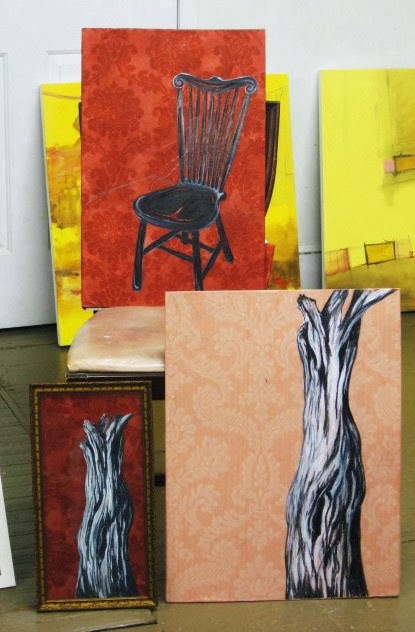 It's time to start thinking about making some new art. But before I could sit down and start thinking about my next print I was asked to take on a new project, coordinating a local exhibition. The BAC announced its 2014 gallery schedule, which includes a show called Belmar and the Railroad. Belmar and the shore have been served by train for many decades, and it's certainly had an impact on the region as tourist destination and as a home for commuters. Last fall I participated in a competition to design a mural for the 80 foot length of the train station. They ended up choosing a professional muralist from outside the area who works in a common contemporary process of painting it on a flexible surface which will be attached to the building later, which makes sense considering paint doesn't dry well in the cold and the busy train station platform may be a tough place to paint a large mural. The plan is to start painting that mural (indoors) later this month and have it installed and dedicated in April. 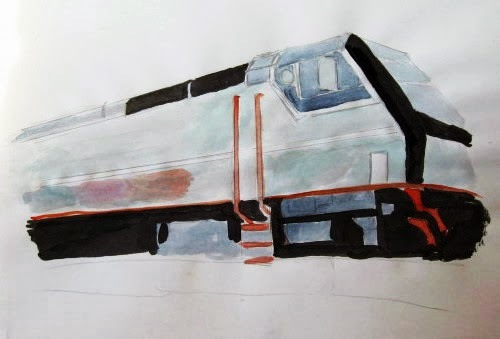 This train themed show will be put together with some contributions from the Belmar Historical Society and will coincide with the mural's debut. So why was I tapped? The BAC is all volunteers, so someone has to get these things done. Our trustees and board members get that task a lot and they can always use a break. I show as much as anyone in the organization, have assisted on several shows, and impressed some people with how I helped organize last year's JAS8 winners show, which featured my Fourth of July series. Plus, it was remembered that my unused mural proposal devoted far more space to the subject of the train than any other one. 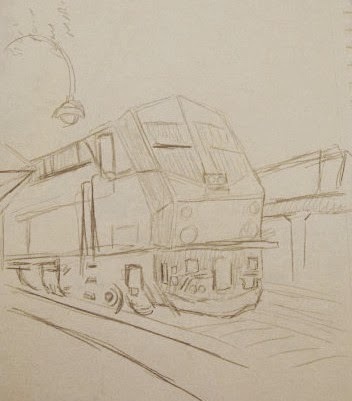 (the idea of including a train in a mural on the train station shouldn't be that unusual, but whatever) So this made me the closest thing they have to a train artist. And perhaps I am. I certainly wouldn't call them a focus of my work, but they do pop up. Although no one there had remembered this, that Fourth series has at least four prints that include train imagery. And also last year I showed a print in a different show that was a scene on our local train. Trains have appeared in at least one other print I know I showed there. I even have an individual train themed print from my Birds and Seeds series sitting in a frame, ready for this upcoming show. I graduated from three schools and currently work at another that all have train stations within blocks of the campuses. So I agreed. As part of this they want me to design a postcard/poster for the show. In the traditional sense I am the organization's one true graphic artist (all this digital stuff ain't art as far as I'm concerned) and with my long interest in trains this should be in my wheelhouse. 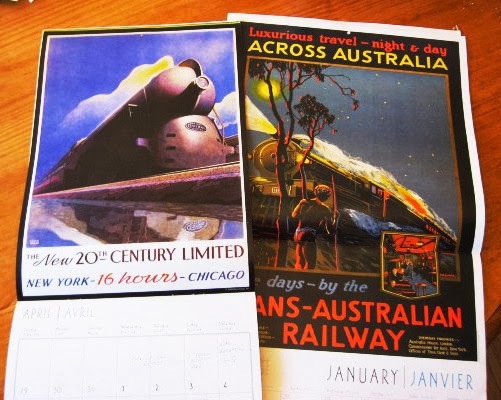 My first instinct was vintage train posters, and I happen to have a few saved calendars (above) from last decade with that theme. Not going to copy anything, but I just thought that seeing the various painterly, precisionist, art deco, etc designs might be inspirational in creating my own advertisement. Trains are also a big part of fine art of the same period. 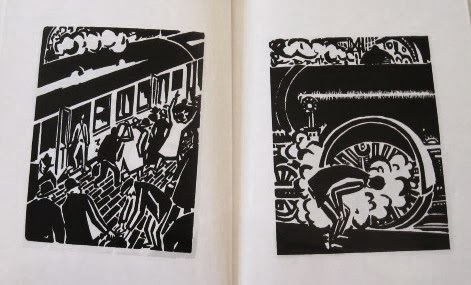 Trains are featured on the first three pages (below) of Passionate Journey, my favorite woodcut novel by my woodcut hero Frans Masereel. The Italian Futurists loved machines as subjects and inspirations, and the two page spread in my college Modern Art textbook on this movement includes two paintings with trains as subjects, one each from Boccioni and Severini. I brought all this stuff to a meeting at the Boatworks a few days ago, along with my bound copy of the Fourth of July (I'm not going to set up individual links, but if you want to see the train prints, go to the dedicated blog and use the archives to look up July 8th, August 4th, and June 3rd and 18th) and a newly produced color rendering of a current train engine based on the one I did for the mural last fall, minus the building architecture. Part of the meeting was to discuss specifics like dates and business parts of the show, and part was to discuss the card art. We decided that the futurist style would be appreciated by a lot of artists, but probably confuse a lot of the general public. The black and white woodcut examples I had brought I had already eliminated- I love that kind of stuff but they've a bit more crude than the look we want. What we decided was to start with an approaching locomotive again, and then to modernize it a bit. Simplify shapes and colors, play up the geometry, but don't let it get too abstract. And they want me to do it as a woodcut, which is fine since that is the way my art looks best. The plan is to have my art done by the beginning of February, so the image (plus digitally added text for show titles, etc) can be used to create the card and posters and give us plenty of time to promote it. I've been thinking about it for the past few days, and today in between various school related stuff I did the above sketch. I had several photos of the train coming and going from Belmar's station. A long side view was the logical choice to fill a big section of that 80' wall, but for this much smaller card I think I'm going to go with a more angled view, which also allows some of the station architecture to be in view. The way the light hits the angles in this view also plays up the modernist geometric shapes better. I like what I'm seeing so far, so I think the next step is to cut a piece of wood to right proportion and start working out the drawing. During much of the last half of last year, I spent a whole lot of time up at the Studio. Didn't make much art; it was almost all time spent in our expanded table shop making tables. I don't keep careful track of Molly's life, but whenever I saw her there she was doing the same thing. I finished all my table work by the beginning of December. I moved all my tools back to the print shop, and I put in a few hours there in December working on my Christmas cards, but between holidays, school stuff, and weather issues, I hadn't been up there yet in 2014. Meanwhile, a week or so ago Molly called to let me know she had finished cleaning out the table shop. Unfortunately, that meant just piling up everything in our print shop, which makes it a challenge just to walk around in there. Molly promises to attack the problem in the coming weeks, but meanwhile we decided it was for the best to relocate tonight's crit to a bigger room. The former table shop was big and empty, but we didn't feel like moving a bunch of chairs and tables in there, so we went with the cafeteria, like last month. We had more than twice as many people there tonight as last month, most with something to show. Above is our starting group. top row (left to right): Mary G's pastel drawing, an early proof of Mary L's new 3 block woodcut, and my most recent Christmas card. 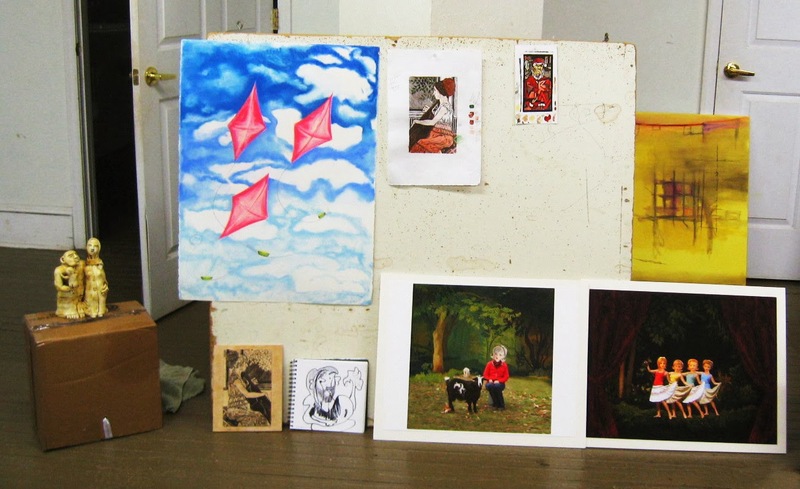 bottom row: ceramic figures from Margery, Mary L's key block, Tim's sketchbook drawing, and two painting/photo collages from Jill. Our other two participants tonight brought multiple pieces- all related works but meant to be seen as individual artworks. Above, paintings/drawings on wallpaper from Christina, below, paintings from Vince. Molly didn't bring anything new to show, but it looks like next month we'll do an on location critique to see one of her recent projects. Well, winter has definitely arrived. I survived picking up my art last Thursday, but had to spend a bit of time on Friday digging out my car from the snow. My plan to submit an artwork on Saturday morning to the year's first show in Belmar got derailed when my car wouldn't start- the below zero temperatures the night before were enough to kill my battery for good. Temperatures were actually relatively warm yesterday, melting much of that snow, and started off today in the upper 40's, but are expected to get down near zero again overnight. It has been already been much worse than that across the midwest, where in many states they've been closing schools to protect kids from the potentially deadly cold. They wish they could get up to zero. On the national news they've been talking about how this could be the coldest weather in this country in 20 years. So what was I doing 20 years ago? Living through an incredibly cold midwestern winter. We'll occasionally get some bad winter storms here along the east coast. I lost a whole week of post Christmas vacation a few years ago, devoting several hours each day to digging snow and ice, waiting for the town to clear the deep snow from the streets. But generally we get a break being so close to the ocean- it moderates our temperatures a bit. In the midwest though, arctic cold air can slide down from Canada and be mostly contained by the long mountain ranges that parallel the two coasts. That whole winter of '93-'94 was bad. Spent most of my semester break canceling plans because of multiple snow storms every week. On my way back to Carbondale in January I passed a tractor trailer that had slid of the highway in Pennsylvania, shortly before running right into a new snow storm, and was lucky to fall in behind a convoy of snow plows on the interstate in Ohio, which helped me make reasonable time until my journey had taken me far south enough to be out of the snow's path. That happened to be the year of my Fourth of July series, and quite a few of the prints included references to ice and snow. Did one print specifically about the cold, and it's days like this that make me glad I don't live there anymore. We are a couple of days into the new year, but there's still some business from the old year to be finished. There are my holiday cards of course. The past few days I've been finishing my fall semester grades. All have been calculated, some have been submitted, and the rest I'll take care of tomorrow. One thing had to be done today, pick up my recent show in Red Bank. 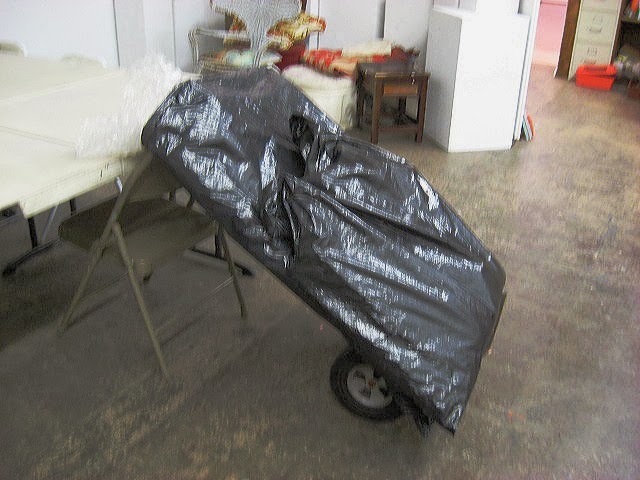 But in the end I got my space, pushed my hand truck (still one of the best investment I ever made) and packaging stuff down the the gallery, packed up my art, loaded it up, and got on my way home. Felt a few flurries while pushing my art back to the car, but no weather dangers today. The storm did arrive as scheduled. As I write this the air is thick with snow, being whipped around by the wind so much that very little has accumulated on top of cars. Got nowhere I have to go tomorrow, so this weather is fine with me.